I visited Germantown Kitchen Garden Saturday morning in search for some fresh local food, and I found it… and more. Salad greens. Check. Radishes. Check. Kale. Check. Bok choy. Check. Shitake. Check. And while I have not met a mushroom I didn’t want to cook and eat and we had crossed paths many times, this time was different. It was a king caught my eye, farmer caught my ear, kind of spark. Culinary inspiration. Check. 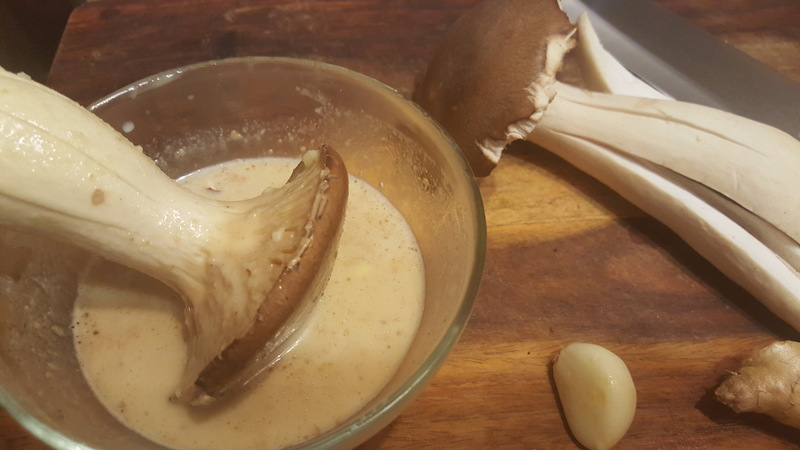 A few of the most fascinating things about mushrooms, aside of the texture and taste, is that they don’t lose phytochemicals (the stuff that gives each food their unique profile) and fiber, even after cooking! Not to mention that their stem takes as good as their cap. Trumpet is also a great source of protein, iron, B vitamins, minerals, Vitamin D, and cholesterol-lowering properties. All Hail the King… Trumpet! Add it to a salad and the meal is light, simple, nutritious and complete. In a small bowl, whisk together lime, sesame seed oil, agave, garlic, ginger, and salt. Immerse mushroom and cover generously, with brush or spoon. Pre-heat pan or grill on medium heat. Cook evenly for 5 minutes on each side or until golden brown. Set aside and let cool. Note: Be sure to reserve marinate for salad dressing. On a bed of greens and radishes, lay trumpet mushroom and drizzle remaining marinade/dressing. Garnish with black sesame seeds. Enjoy!